Specifically designed for the coldest riding conditions on earth, the Klim Arctic Balaclava features a massive feature list fit for the most extreme climates. From the base, the Arctic Balaclava brings a massive, ultra-wide skirt to ensure it stays put. Add in; full Windstopper® frontal attack with Klim’s variable fleece backer thicknesses around eyes (to enhance fit and reduce restriction), full neoprene nose piece/breath deflector, lycra stretch back, conformed neck fit, and super stretchy fleece over the head. All-in-all, this is one Balaclava that can take it all. Specifically designed for the coldest conditions/harshest elements. Ultra-wide skirt provides max wind protection and stays tucked in. Heavy fleece Windstopper® main body construction. Compact fleece Windstopper® eye port construction. Super stretch head fleece-lycra stretch back to fit different head shapes/sizes. Gathered stretch side-of-neck keeps it secure. I was excited to get this but disappointed after putting it on. If you wear glasses this is not for you, I took my glasses off to put on, then put my glasses on and was afraid it was going to break my side arms. My glasses fogged up, your breath is deflected but there is still way to much warm air coming up. The fit around your eyes is small, other than that the fit is nice. Probably work great if you do not wear glasses. 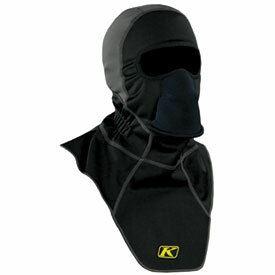 I bought this to have a heavier alternative to my old under armor balaclava and it is definitely worth the money. It is now my go to head wear now that winter is here. It covers down the neck in front and back so wind does not chill your exposed areas that my other balaclavas leave unprotected. It does a great job blocking wind and keeping the wearer warm. I recommend this to anyone willing to pony up the extra cash because it is worth it. first off, this thing keeps my head & neck warm & toasty! love the molded breath guard, there is an opening underneath it so you can still drink from your hydration pack. only reason it does'nt get 5 stars is that the eye port is way too small; peripheral vision is blocked too much.